Erasing The ‘Memory’ Of Cocaine: A Breakthrough In Treating Addiction ~ Health Matters Today! 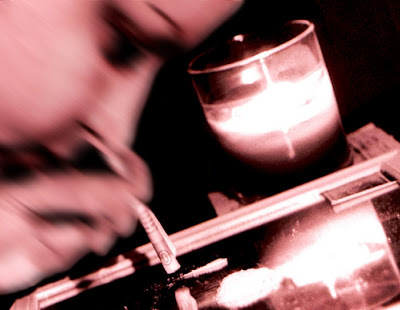 Unlike many other drugs, cocaine does not trigger a physical addiction. It can however cause a psychological one in some 20% of its users, which can push them to lose control over their consumption, and can often lead to dire consequences. Now, neuroscience researchers from Geneva University may have found a way to erase that memory through a new laser technique that they have successfully tested on mice. The scientists focused on a part of the nervous system called the “reward circuit.” The main function of this network of brain cells is associating vital behaviors – like eating or reproducing – with feelings of pleasure. Information is transmitted between two different areas of the brain: one holds information on levels of satisfaction, and the other registers the context in which it happened. Cocaine abnormally raises levels in the brain of dopamine, a substance responsible for the transmission of information between both parts of the brain. That phenomenon forever marks the brain and explains why even after years of sobriety, a recovering addict can still be tempted by the drug. “Take someone who took cocaine in a certain place. Even sober, this person won’t be able to walk by that same place without some of his brain cells getting excited and awakening a desire to take the drug,” says Vincent Pascoli, the lead researcher. It is this hidden memory, mixing context and desire to use, that the researchers say can be erased. Working on mice that have ingested cocaine, they infect certain brain cells in a virus that introduces a light-sensitive protein that can be targeted by a laser. With the use of a laser, researchers were able to control brain activity and bring information transmission levels back to normal. The process proved a success in the short term, with the mice acting like they’d never taken cocaine in the days following the procedure. The long-term effects have yet to be tested on mice. And of course, the procedure must still be tried on humans. Erasing cocaine memory? That sounds really new to me. Though a little in doubt, I believe that it will be very helpful.